As I start my journey as your Chief Scout, I am not going to tell you the solutions to the world’s problems, or the cure for cancer, or how to save the climate, nor have I climbed great mountains or swam the seas, I am just a Scout. But that means that I have promised to do my best…. at whatever I do. I want our young people to become the most awesome adults of the future. I want them to have self-esteem, I want them to be proud of who they are, to take care of each other, to learn to share some of their extra energy on those that need it, and to appreciate and be grateful for the beautiful and amazing world we live in, and to be aware of their power to be a positive influence in that world and be prepared to exercise it. Our South African children today face a set of challenges that should scare us. Between unemployment, hunger, the general economic situation, balancing free speech with human rights and the need to compete for jobs and university places – if they are lucky enough to get that far – they have a long road to travel with many opportunities to fall by the side of the road. Mix in some of the moral uncertainty that our modern society is struggling with and you see what our children face. I believe in my heart that we can, through Scouting, offer those children a sanctuary, a hand up from the places where they fall down and scrape their knees, and a supporting influence to regain their confidence and self-esteem. A place where they are not judged on anything other than doing their best, where they can learn to play and work together, to behave and work within the bounds of the Promise and Law. A place where they can grow to be the kind of adult that we would like to have around us every day. I have often been asked when people hear that I am a Scout, as to why I give up my time and energy to work for other people’s children, and my answer is simple. I want my daughters to grow up in a world where they are respected as human beings, where they are given the opportunity to be the best that they can be, where people care about the environment and for each other. Now, much as I would like to, on my own I cannot change the world to give them that, but what I can do is support each and every one of you as you work in your regions, districts and groups, from the urban buzz of Sandton to the hills outside Ixopo or under a baking sun in Mahikeng or Limpopo, to make a difference in the lives of the children you work with. And I do that in confidence that those young people we work with will be positive influences in the lives of the people they interact with, so, like throwing a stone in a pond, the ripples of those actions reach out and impact on as many of the people in our great country as possible. As I said, this is not a task for one man or woman, but for the entire Scouting “village”. So before we go further I would like to introduce you to the great team I have to work with. All the National office employees, National volunteer team and board members are responsible with me to make sure we have frameworks in place and deal with the “big” financial and legal issues that any organisation like ours have. The Regional Commissioners and their Regional teams are the eyes and ears of Scouting, providing local support and ensuring we share the best of what we are all doing, and become aware of challenges and work collectively to solve them. Our DC’s, SGL’s, Scouters, adult volunteers and committee members, you are the most important members of our team, you give of your time every week and most weekends to be the people who really make a difference – without you Scouting could not continue to exist. You see from where I stand we cannot change the lives of a single young person out there unless we all work together as a patrol to make that difference in the lives of young people. We are one team, one Scouting family and I would like to recognise you all for that. Thank you! My job, and my commitment to the Scouting family, is to work with you and all of the incredible people we have working in the Districts, Regional and National teams to make sure that the Scouters in the Groups on the ground, who are working every day to make a difference in the lives of our youth, have the resources and support they need to do that job to the best of their ability. 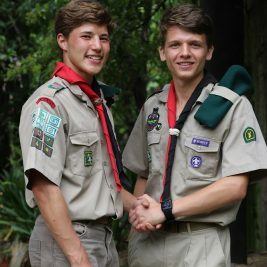 During the Lekgotla, our first ever National meeting of Scout Groups, we shared ideas and concerns, and grew to understand each other just a little better, and while we didn’t always agree on everything, we worked as Scouts to find the common ground and values that we need to align to. I and the supporting structures of the movement have heard what you have said and we will be taking that forward into concrete actions as we move to be there for you. When I arrived at the inauguration ceremony I had a small family for which I was responsible, a mom, 2 brothers and 2 sisters, a wife and 2 children. Now that I have the honour of being your Chief Scout, I have more than 5000 brothers and sisters who are working on the ground to prepare the youth, to make this country a better place. I have also suddenly acquired about 190,000 children, with many more on the way! We are all part of the family of Scouting, but what a family! 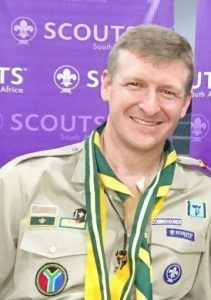 Thank you for your confidence in me and God bless you all as we continue the good work of Scouting here in our beloved South Africa.